As the Divine Cupcake’s Public Relations & Marketing Intern for six months, I worked on Facebook Adverts, Google Adwords, gaining media exposure, improving social media efforts, and building relationship with potential clients and other local businesses. 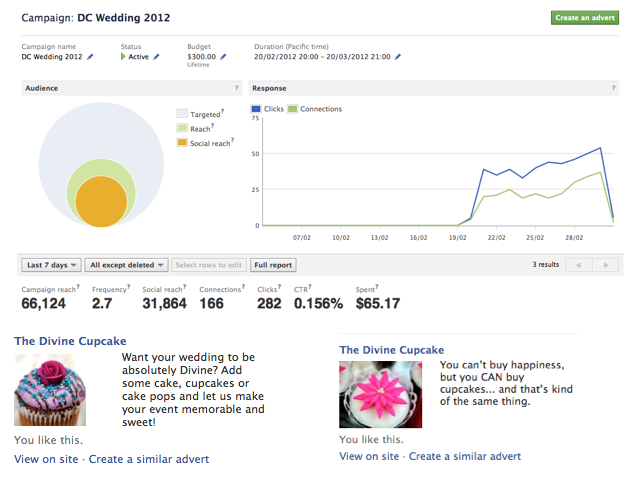 While interning for the Divine Cupcake, their Facebook Page grew from 6,954 “Likes” to 9,138 over a four month period. Twitter Followers also increased from 1,566 to 1,725. I sent out media pitches to local News Stations (for example, I sent out a media pitch to promote the Divine Cupcake’s Two Year Anniversary.) It was very exciting when KVAL covered the story! Lastly, I formatted a Promotional Pamphlet to distribute to local businesses and elementary schools to gain exposure for the bakery.